India failed to track down a 200 plus total for the second time in the series. 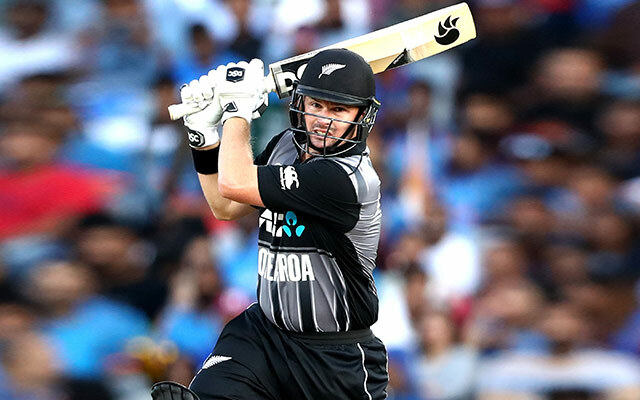 The third and final T20I between New Zealand and India at the Seddon Park in Hamilton turned out to be an absolute thriller. The batters made hay even as the bowlers were taken to the cleaners. Eventually, the hosts, captained by Kane Williamson, won by a margin of four runs. It also made sure that Rohit Sharma’s men were denied their maiden T20I series victory on New Zealand soil. After India won the toss and elected to field first, the Black Caps amassed 212 for four in 20 overs. It was also their second score of 200 in the series. Colin Munro and Tim Seifert took their team off to a decent start with a stand of 80 runs from 46 deliveries. Chinaman bowler Kuldeep Yadav drew first blood, dismissing Seifert after he scored 43 from 25 balls. MS Dhoni also showed tremendous glovework. Munro accomplished his half-century in 28 balls and ended on 72 runs off 40 balls and his knock was laced with five boundaries and as many hits into the stands. Kane Williamson and Colin de Grandhomme scored 27 and 30 runs to keep the scoreboard moving. Daryl Mitchell and Ross Taylor provided the finishing kick with scores of 19 and 14. Bhuvneshwar Kumar and Khaleel Ahmed picked up one each. India didn’t get off to the best of starts as Mitchell Santner accounted for Shikhar Dhawan’s wicket. However, Rohit Sharma and Vijay Shankar steadied the ship with a partnership of 75 runs. Santner broke the ominous-looking stand in the ninth over. Shankar notched 43 runs with five fours and two sixes. Rishabh Pant came out firing on all cylinders and churned out a breezy 28 with one four and three sixes. Pant fell prey to Blair Tickner. Hardik Pandya also perished after racking up a quickfire 21 from 11 deliveries. MS Dhoni tried to play attacking cricket after the outset, but couldn’t make an impact. With 30 runs required from 12 balls, Dinesh Karthik tried his heart out and scored 33 runs from 16 balls with four sixes. Krunal Pandya raced to a 31-ball 46. Unfortunately, both their efforts went in vain. Rohit Sharma : We are not getting wickets. Krunal Pandya in the last match.